One of the best new shows this TV Season is ABC’s The Rookie created by Alexi Hawley and starring Nathan Fillion as John Nolan, a forty-year-old rookie in the Los Angeles Police Department. After he is accidentally involved in helping the police during an armed robbery, John sells his construction company, finalizes his divorce, sends his son off to college, and moves to Los Angeles where he enrolls in the police academy and manages to graduate with all the twenty-something recruits. As the oldest rookie on the force, John has to work twice as hard with his training officer, Talia Bishop, played by Afton Williamson. Melissa O’Neill plays Lucy Chen, the second new rookie and her training officer, and Tim Bradford, played by Eric Winter. The third rookie is Jackson West, played by Titus Makin. He is paired up with Angela Lopez, played by Alyssa Diaz. Richard T. Jones plays watch commander, Wade Grey, who believes Nolan is just having a midlife crisis and really isn’t cut out for police work. Mercedes Mason plays Captain Zoe Anderson, who oversees all the Wilshire Area. The show is billed as a crime comedy-drama. It fits the description perfectly. We see each of the three rookies and their training officers as they patrol the streets of Wilshire Area, Los Angeles. John is definitely older and sees things from a different perspective. Lucy is his love interest in the first few shows. Jackson graduated at the top of his academy class, but he has a hidden secret that could get him and his training officer hurt or killed. Training Officer Tim Bradford also has a secret that causes him to be brash and arrogant. 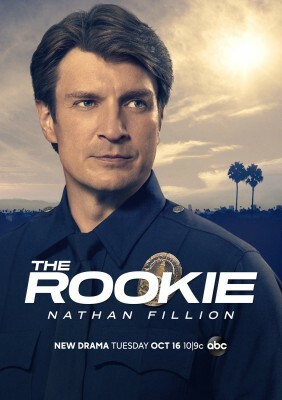 I am familiar with Nathan Fillion after his long run with ABC’s Castle, another crime comedy-drama, and he is also known for his role in the cult favorite Firefly. The rest of the cast is engaging and really pull the storylines together. The storyline in each episode combines both comedy and drama. If you want a show that will make you think and laugh, this is it. I like to relax and be entertained by the shows I watch and this hits all the right notes! I highly recommend it! You can learn more on the show’s website. The show just had their winter finale but will be back January 8, 2019. Check out other mystery articles, reviews, book giveaways & mystery short stories in our mystery section. And join our mystery Facebook group to keep up with everything mystery we post, and have a chance at some extra giveaways. Also listen to our new mystery podcast where mystery short stories and first chapters are read by actors! They are also available on iTunes and Google Play. The newest episode is set at Christmas time. I didn’t care much for this show at first, but I stuck with it and I’m glad that I did, especially since I’m a Nathan Fillion fan. Now I like the characters, their relationships with one another, and the plot lines. I’ve grown to care about the characters, which is a sign to me that the show works for me. I kept forgetting to watch this. Will check out the website and watch it in January. Thx for the review, Doward. Merry Christmas!